Players will find everything necessary to craft a Consular character in this 96-page full-color handbook, including new Consular specializations—the Arbiter, Ascetic, and Teacher—new races, new Force powers, and extensive armor and weapon inventories. Discover new droids, vehicles, starships, and even rules for rare and damaged lightsaber crystals. The path of the Consular is one of balance, a path that may be difficult in a traditional, combat-oriented setting. 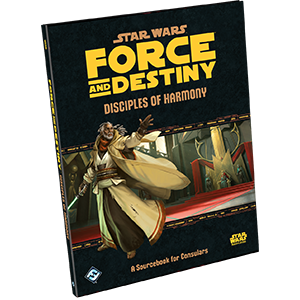 As such, Disciples of Harmony features a section for Game Masters on including Consular characters and NPCs in your campaigns and how they can contribute when the lightsabers ignite and the blasters start firing.